When I first began Tempest I thought "Oh, this is like Jumper" (the movie with Hayden Christenson) then I thought "Wait, no it's definitely not!". Trust me the only thing remotely similar is that Jackson calls time-traveling "jumping" other than that there really is no similarity. Jackson is moving through time not just from location to location. 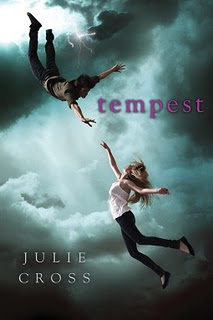 Tempest is like a YA version of The Time-Traveler's Wife by Audrey Niffenegger (which I highly recommend). There is so much more to this book than the love story between Jackson and Holly. There is a struggle between Jackson and his father as well as Jackson coming to terms with his sister Courtney's death. Jackson having to come to terms with his own abilities and what those abilities mean for him and the people around him. There are underlying issues of morality and ethics; war and the significance of human life. If you thought Tempest would be just another YA book with some supernatural aspect, then you were wrong. Although the supernatural aspect is at the forefront of the book (a huge element of the plot) it is not the only thing that defines the main character. Jackson is a very compassionate boy and we go through a large series of emotions with him. Even though this is the beginning of a Trilogy Jackson is already growing within the first book, and I find that amazing and a sign of a great author. Usually the beginning of a character's growth starts at the end of the first book within a series, but with Jackson it is through out the first book and the start of a significant change at the end (I really hope that makes sense). I cried and laughed (out loud) and my heart really went out to Jackson for everything he has to go through. I'm not sure I would be able to handle the same choices that he has to make, because he has to consider more than just how he will be affected by his decisions. Tempest truly stands alone in the sea of YA books on the market right now. I haven't experienced anything like it, and I believe readers will appreciate something different. The only fault in Tempest is that we are thrown into the middle of chaos (small chaos) at the beginning of the book and it was very confusing as to what was going on. Plus, I was let down that we didn't have a real description of what Jackson looks like. We know what the other characters look like because Jackson describes them, and we have small hints of what he looks like but I had trouble trying to imagine him in the way the author wanted me to. Although, maybe it's better that we get to imagine him in the way we want to. Overall, I can see why this book is creating such buzz, and why Summit Entertainment would buy the book even though it hasn't been released yet. It will be interesting to see what a film adaptation will bring to this book. Like my blog? Grab my button! Sarah's Shelf. Watermark theme. Powered by Blogger.